Step 1. Preheat oven to 180°C (160°C fan-forced). Combine water and yeast in a small bowl with a pinch of caster sugar. Leave for 3-4 minutes until frothy. In a small saucepan, heat milk until almost boiling. Add butter, salt and sugar and stir to combine. Set aside to cool. Stir through yeast mixture. In a stand mixer with a dough hook, combine flour and lemon zest. Add wet mixture and egg. Mix for 8 minutes or until soft and elastic. Place dough in an oiled bowl, cover with a tea towel and set aside somewhere warm for 1 1/2 hours until dough has doubled in size. Step 2. Turn dough out onto a lightly floured surface. Roll out into a large rectangle, approximately 5mm thick. Smear entire surface with butter. Combine sugar with cinnamon, and sprinkle this over the dough. Step 3. Starting at one end, roll the dough into a log and slice into 18 even pieces. Step 4. 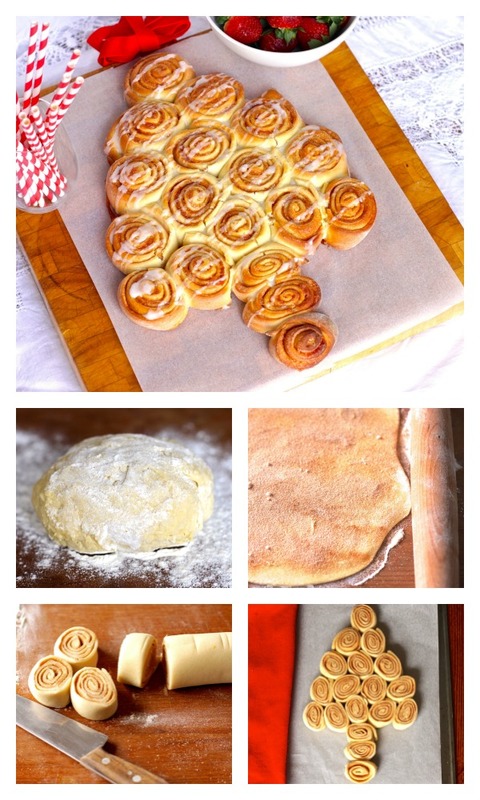 On a large oven tray lined with baking paper, arrange cinnamon rolls in a Christmas tree shape. Bake for 20-25 minutes until lightly brown. For glaze, combine icing sugar and milk in a small bowl. Drizzle diagonally across the cooled cinnamon roll Christmas tree. If you don’t have a stand mixer, you can knead the dough by hand. Place flour and lemon zest in a large bowl, make a well in the centre and pour in wet ingredients and egg. Combine well, then turn out onto a floured board and knead for 10 minutes until soft and elastic. If you want to get creative, use coloured icing and cake decorations to ‘trim’ the tree. If you are looking for a simple homemade dessert for kids then this Christmas Yule log is the perfect buffet dessert. These Edible glitter berries are the perfect addition to a platter, buffet table or even on the top of your favourite chocolate cake. You can make these Christmas chocolate spoons with the kids and enjoy some family time as you decorate them together. This Fruit Christmas tree is a healthy alternative to all the indulgence of Christmas. It could be a beautiful, edible centrepiece for your table. These Caramel Christmas apples are a delicious take on toffee apples for the festive season. You can make these Christmas ginger joy biscuits and thread them on string to create a Christmas decoration. These Gingerbread families are made with a traditional gingerbread recipe and decorated with Royal icing. These Christmas crackles are also a fun cooking activity for kids. If you like rocky road then these Christmas rocky road bites are a delicious. Just don’t forget they contain nuts so you may need to label them.